The Health Trust, its partners, and elected officials will celebrate the launch of the Good. To Go. initiative and showcase the first "conversion" of a San Jose corner store on September 17th, 2014,10am-11am. Emit Mini Mart is the first local food retailer to convert part of its floor space to provide fresh, fun and healthy food to a wide array of San Jose residents. See photos and descriptions of Good. To Go. Corner store conversions at our Facebook page. This is a fundamental shift away from the increasing health hazards of processed, sugary foods delivered to the nation’s kids. We expect to have local elected officials on hand, as well as local Latino radio personalities. Good. To Go. is also part our overall effort to provide healthy food to deprived neighborhoods via Fresh Carts. That effort won The Health Trust The Google Bay Area Impact Challenge in June 2014. Many San Jose neighborhoods rely on local corner stores and mini marts for their food purchases – businesses where snack foods and sugary beverages are plentiful while fresh fruits and vegetables are scarce. The Health Trust Good. To Go. 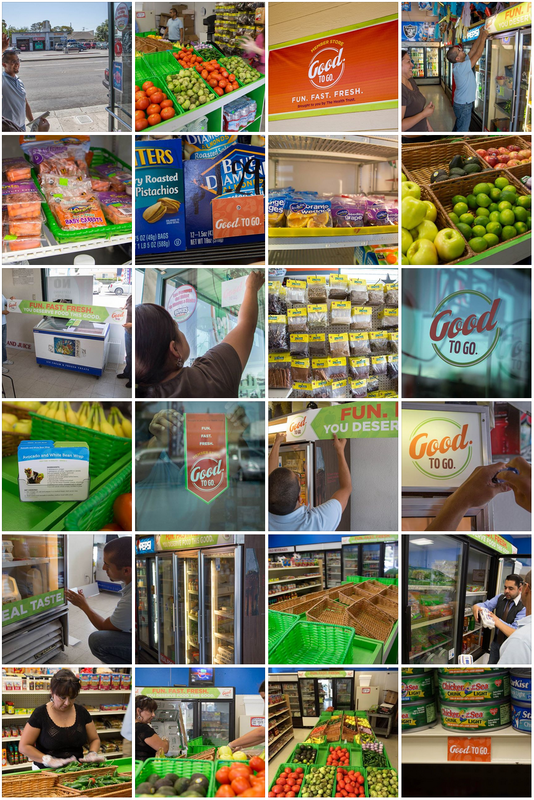 initiative is changing this by increasing the number of places where fresh and healthy foods can be conveniently and affordably purchased and, equally importantly, by marketing these new “fun, fast, fresh” foods as a superior competitor to packaged convenience foods. Emit Mini Mart is one of dozens of stores participating in the initiative through healthy makeovers. About Healthy Corner Stores The Healthy Corner Store campaign is being launched this year by Hispanic Chamber of Commerce- Silicon Valley (HCCSV) to provide equipment, upgrades, training, marketing materials, and business development assistance to store owners who agree to carry fresh produce and other healthy “grab-n-go” items. Forty stores will be converted over two years with help from HCCSV’s bilingual business advisors and managers, The Food Trust, Salter Mitchell, and The Health Trust. For more information, visit http://healthtrust.org/our-work/eat-well. About Good. To Go.Good. To Go. is a community-based campaign aimed at increasing San Jose residents’ purchase of produce and healthy foods. The campaign is organized through a network of on-the-ground, trusted community vendors, including corner store retailers, Fresh Cart mobile produce vendors, and urban farmers. Participating vendors receive branded materials, marketing assistance, and media coverage to drive consumer demand for the new “fun, fast, fresh” items atGood. To Go. outlets. For more information, visit the Good. To Go.Facebook page: https://www.facebook.com/gd2go. About The Health TrustThe Health Trust is a nonprofit foundation that provides grants, services and advocacy to support its vision of Silicon Valley as the healthiest region in America through its three initiatives – Healthy Living, Healthy Eating, and Healthy Aging. The Health Trust Healthy Eating Initiative works to increase access to healthy foods through policy and system change. The Health Trust won Google’s Bay Area Impact Challenge in June for its proposal to create new distribution channels for affordable produce in Santa Clara County, receiving $500,000 to distribute 50,000 pounds of produce to 10,000 low-income residents in Santa Clara Valley. For more information, visitwww.healthtrust.org. This is such a good idea, and great to see it's happening in San Jose!